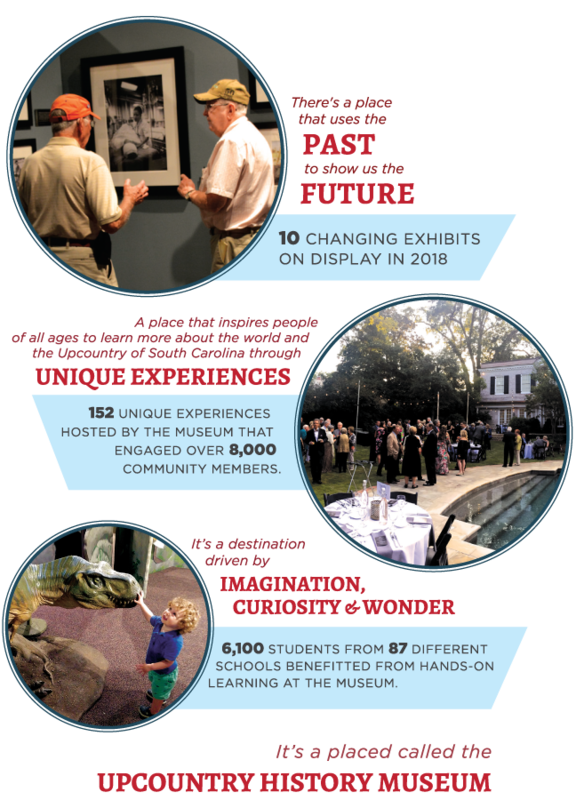 When you make a gift to the Upcountry History Museum – Furman University, you provide much more than critical funding for the transformative educational programs and unique cultural experiences that define the museum. As a supporter, you provide opportunities for children and adults to explore, learn, and dream. Your gift provides a place where people of all ages discover the pastwhile imagining the future and are inspired to dig deeper into history. Through your gift, the Museum is able to provide programs, exhibitions, and services to over 65,000 visitors each year, engage the public with local and national history, facilitate dialog with diverse audiences, present the American History Book Club & Forum, and collect, preserve, and educate for the enrichment of present and future generations. It is only through your support that we can continue to grow our programs and exhibits, ensure that all children have access to inspirational experiences, and preserve our community’s history for years to come. Thank you for making a difference in preserving and disseminating the Upcountry’s history. As the Museum celebrates its 10th Anniversary, I hope you will join me in making a difference through a gift to the Museum’s 2018 Annual Appeal.